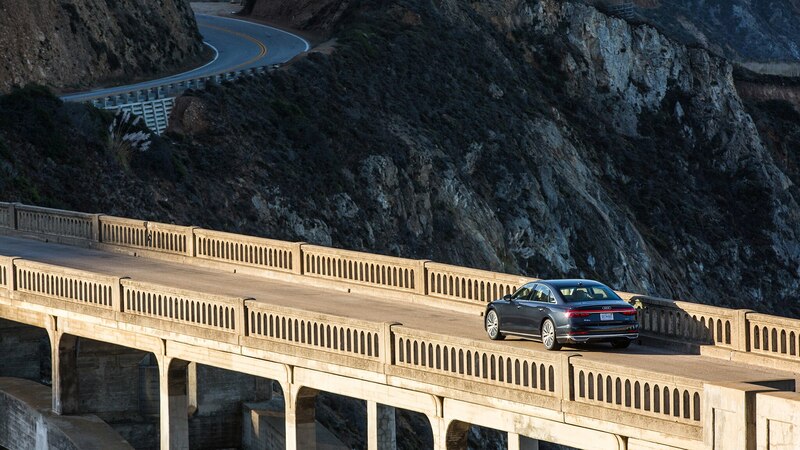 BIG SUR, California — Big luxury sedans are like power suits for CEOs: sartorial armor for the road. 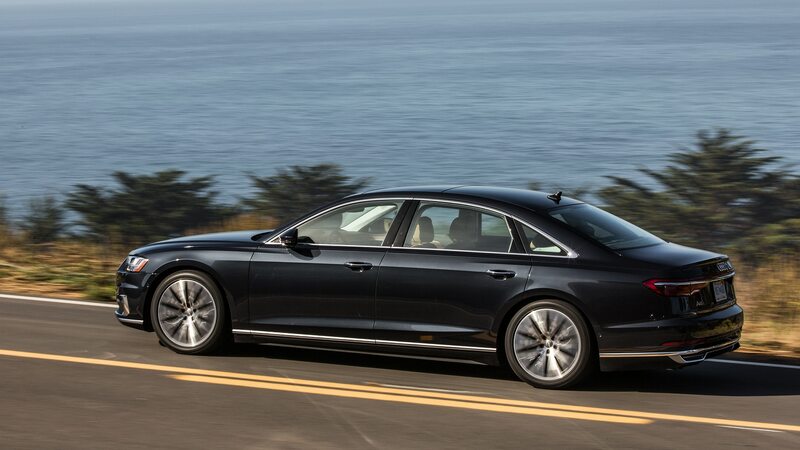 With a value system as codified as the Tom Fords and Brionis that upholster boardrooms, flagship four-doors pack peak concentrations of engineering and design, much of which will eventually trickle down to the H&M and Gap-grade models. 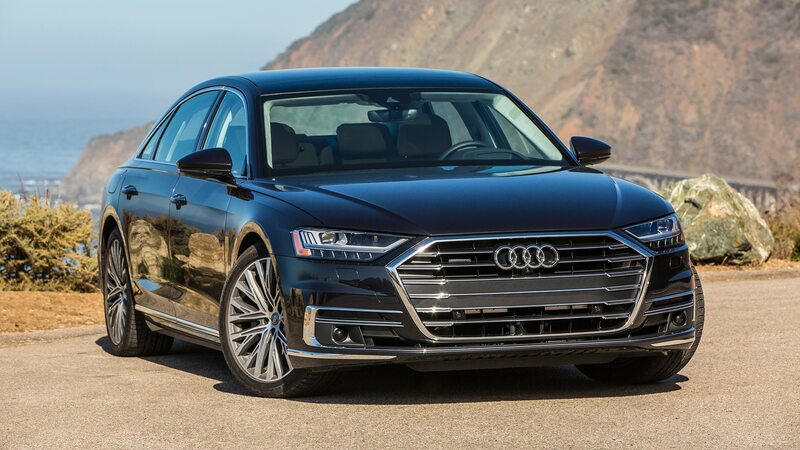 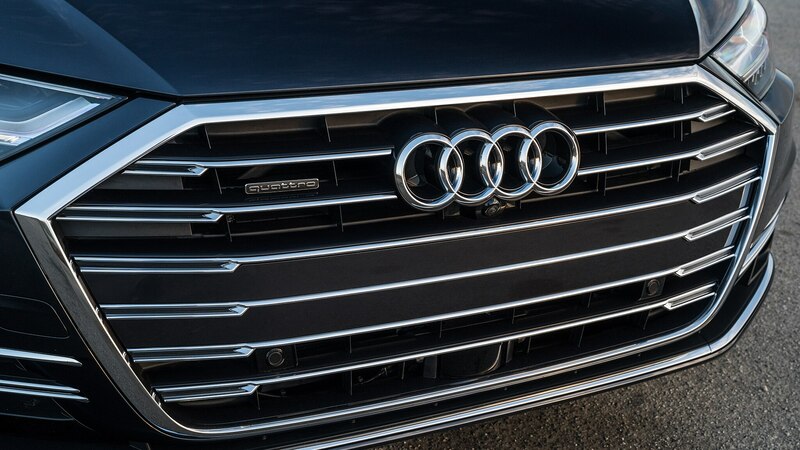 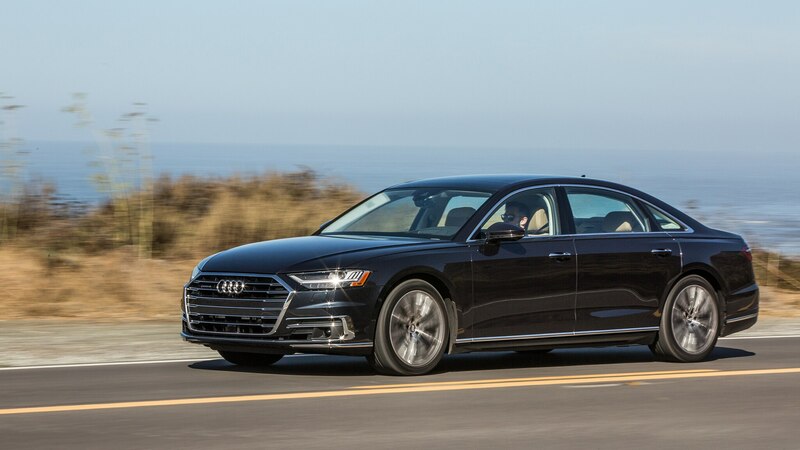 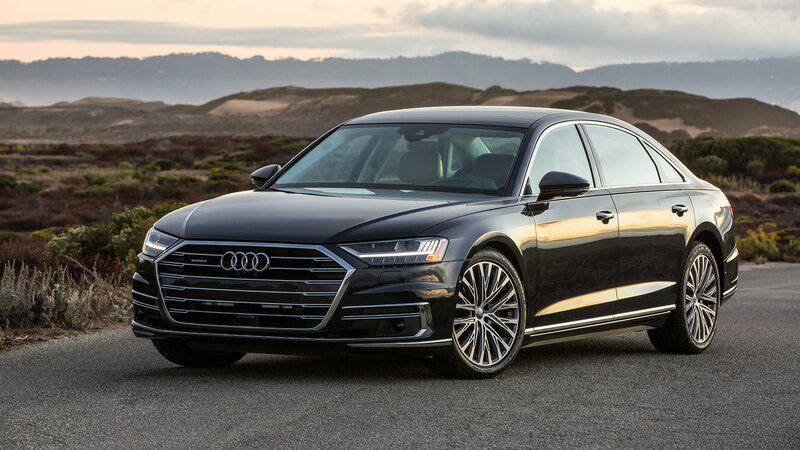 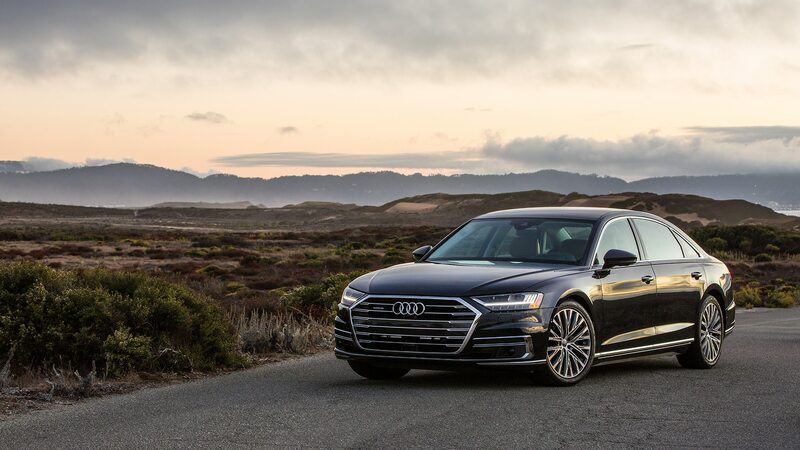 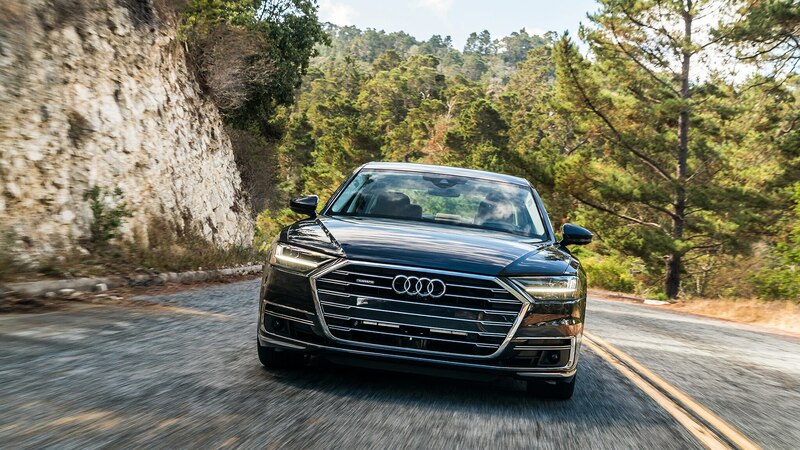 Riding high on 107 consecutive months of stateside sales growth, Ingolstadt has invested untold resources into making the 2019 Audi A8 the flagship-iest of flagships to date. 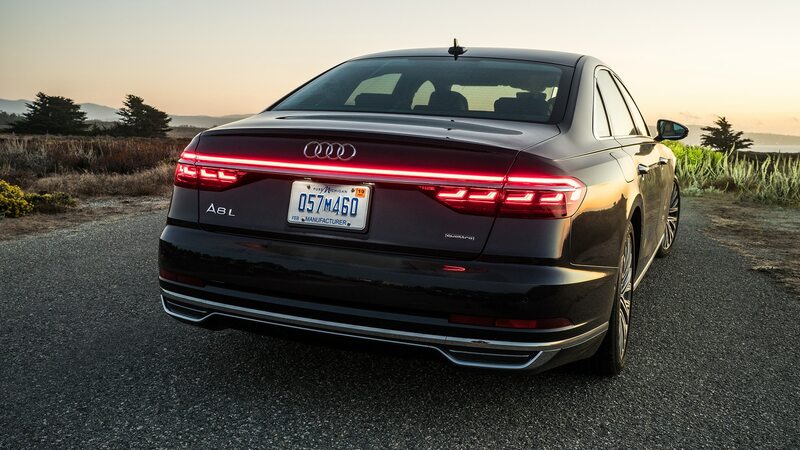 The power play came early with the development of a mess of sensors, cameras, and the world’s first laser scanner to push it past the Level 3 autonomous finish line first. 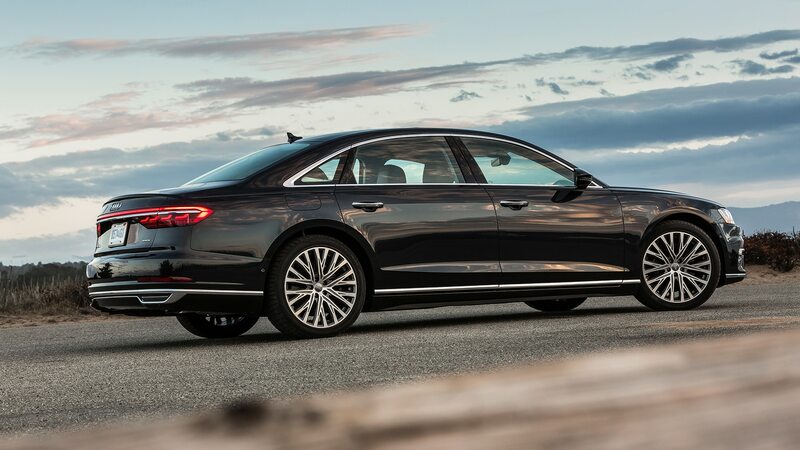 (A counter move has only recently been announced by Mercedes-Benz for its next generation S-Class.) 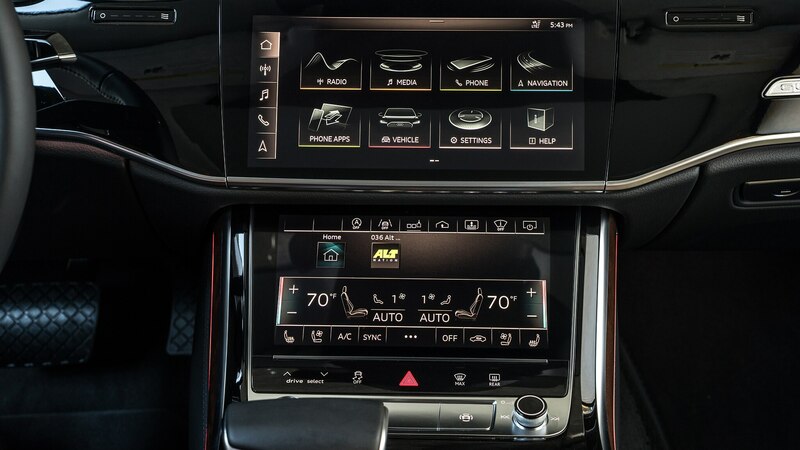 Despite these efforts, U.S. lawmakers have yet to agree on a common standard—making the advanced hardware a moot point for now. 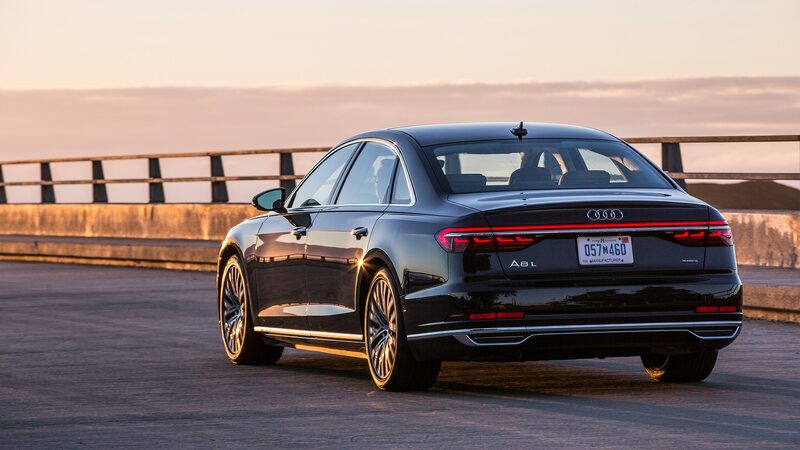 Despite emerging technology’s horse/cart conundrum, the A8 deploys an armada of advanced features in its newest form. 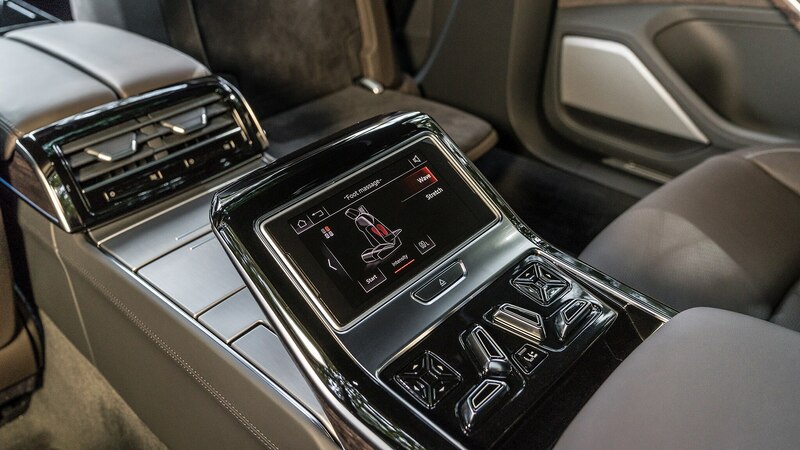 The most distinct harbinger is its future-friendly interior. 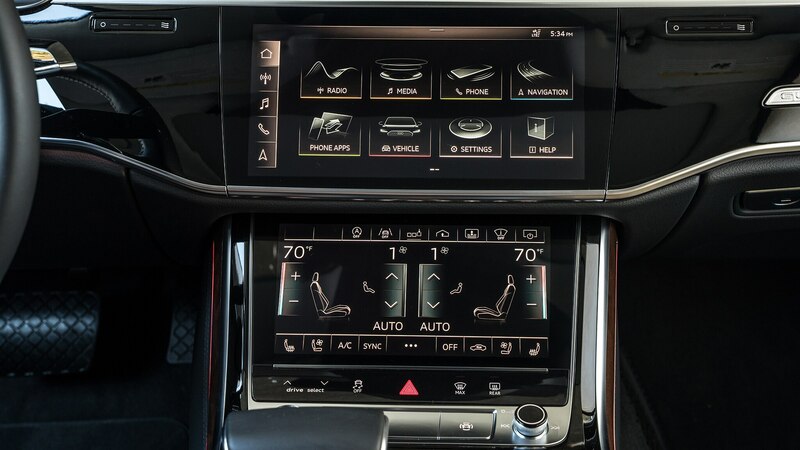 No fewer than 35 buttons have been eschewed in favor of flush, black panel displays within the cabin. 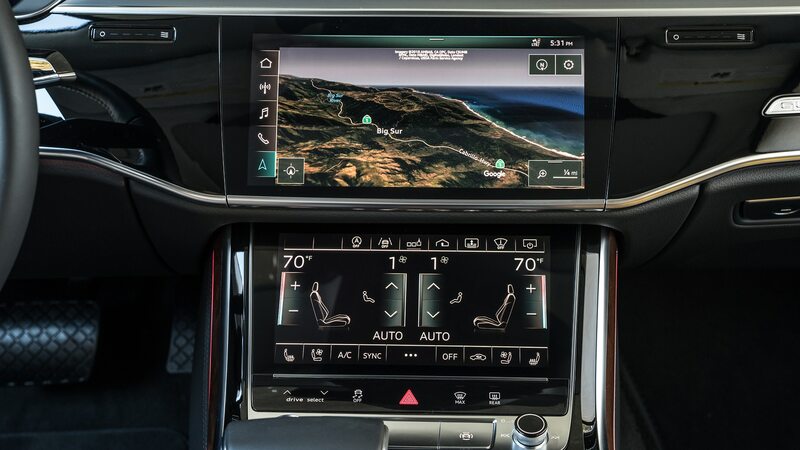 Two touchscreens (10.1-in and 8.6-in) front and center and a next-gen, high-definition widescreen virtual cockpit display allow access to nearly every vehicular setting, save a physical volume/power knob and a few discreet controls like sliders that expose or recess the HVAC vents behind rotating sections of flush-fitting veneer. 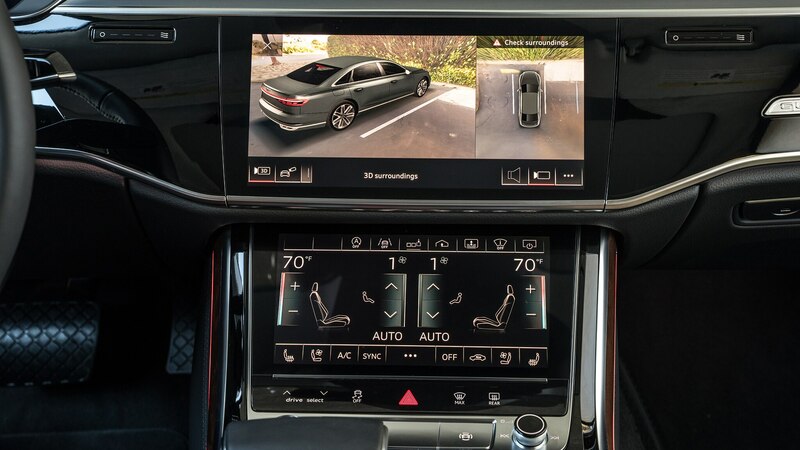 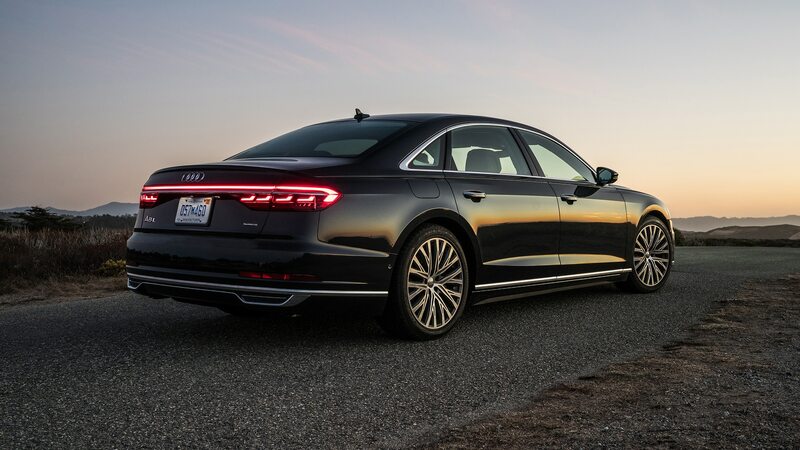 Unlock the doors, and the 2019 A8’s exterior LEDs greet you with brief animated lightshow; inside, the welcome continues with several streaks of customizable tinted illumination. 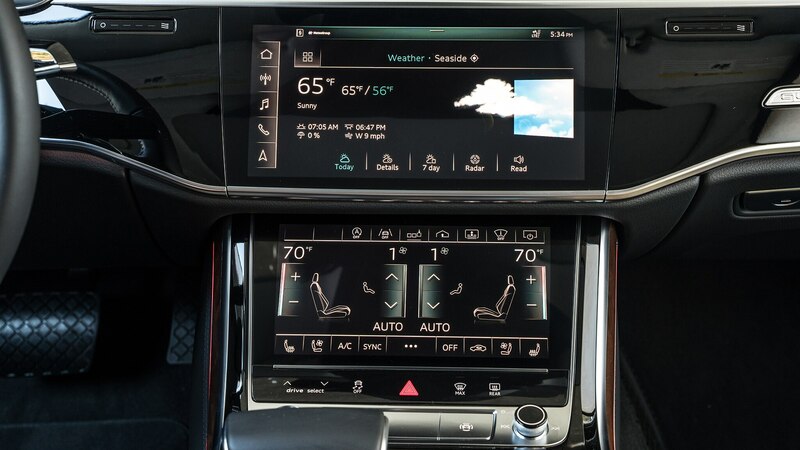 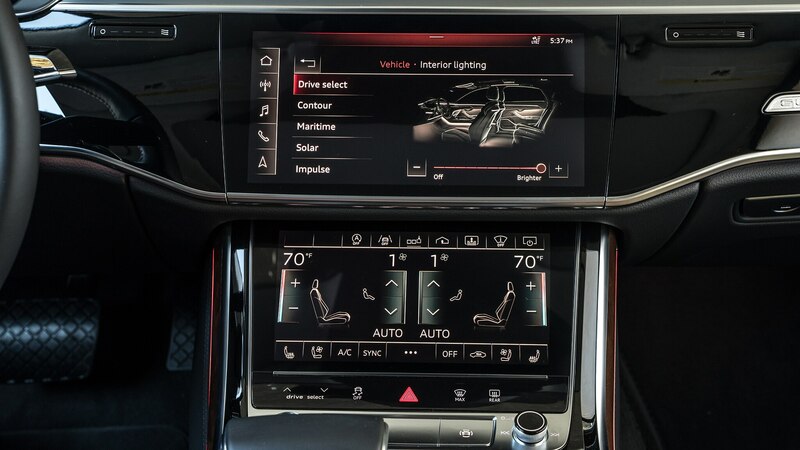 Between the multi-hue adjustability and a slew of other variables (among them cabin scent, massage, and climate control), some 700 settings can be memorized for a total of seven users—a plethora of personalization can be daunting. 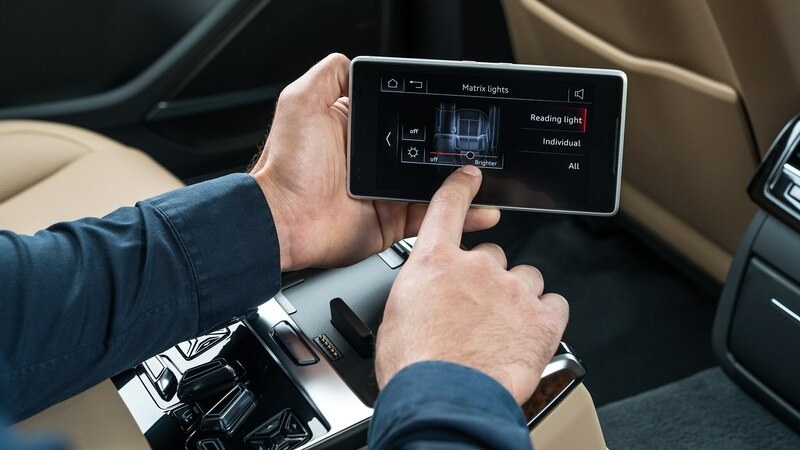 But fortunately (actually, annoyingly) there’s a bit of functionality, including adding a Bluetooth connection, that’s locked out while the vehicle is in motion. 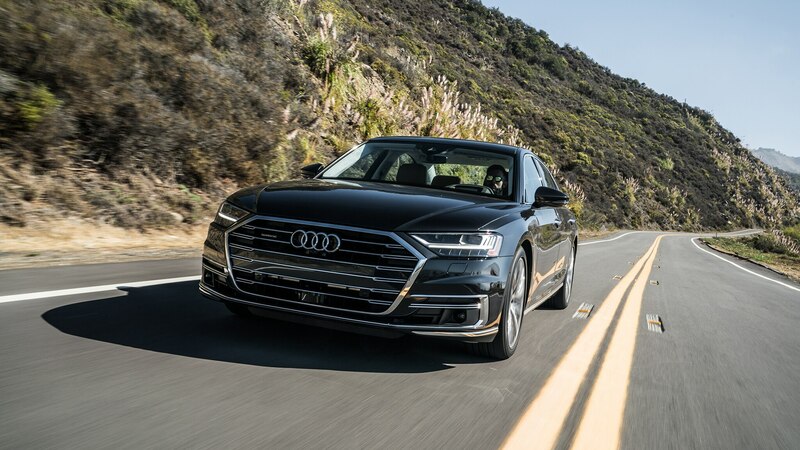 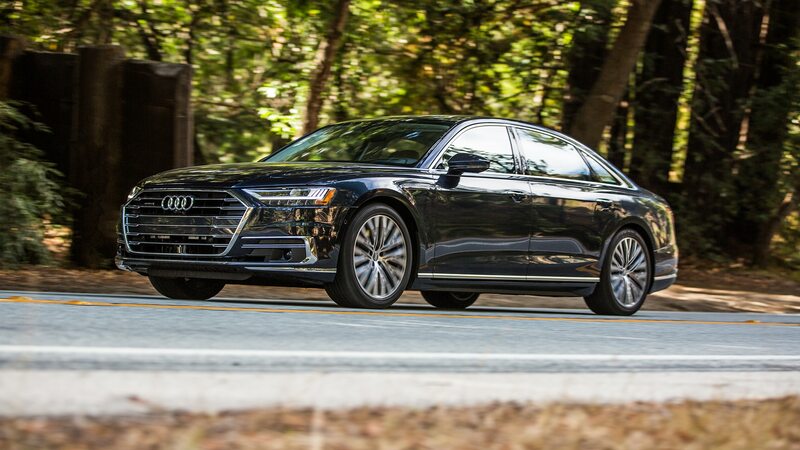 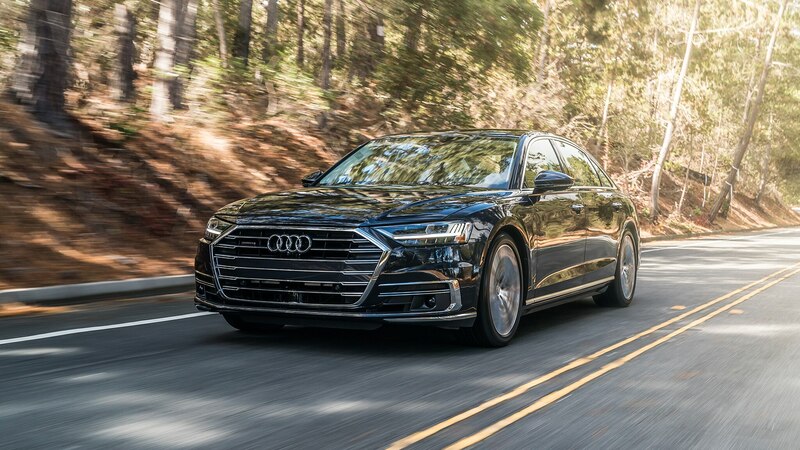 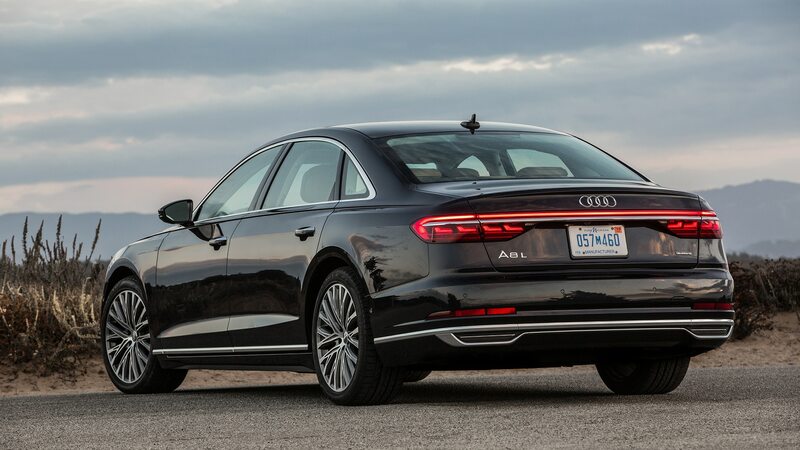 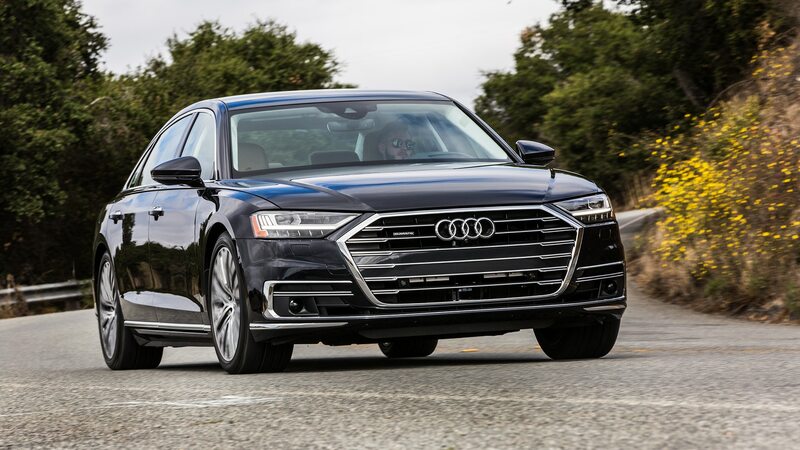 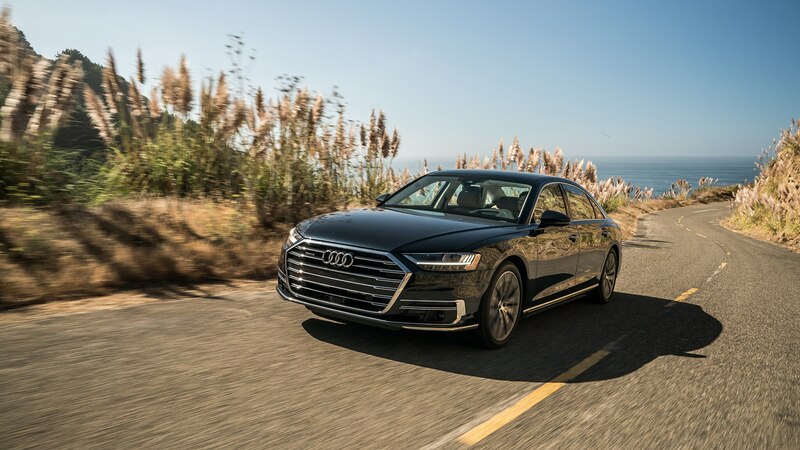 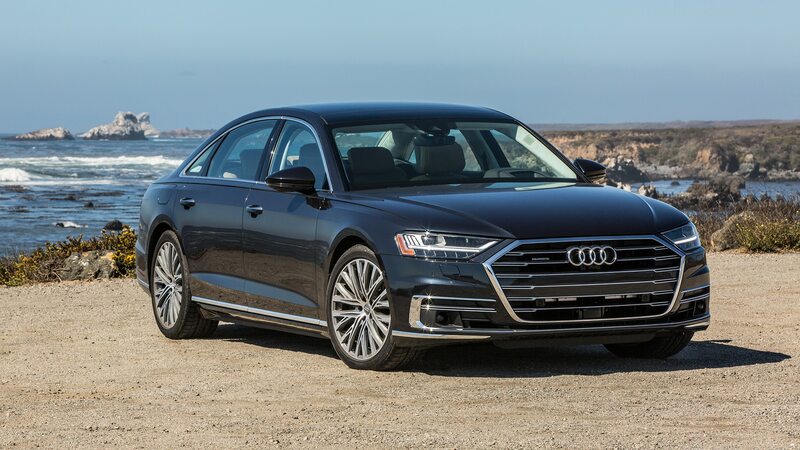 At least the Audi A8 is pleasant in motion, thanks to its breezy drivetrain, a rather well-isolated chassis, and competent, bump-soaking suspension. 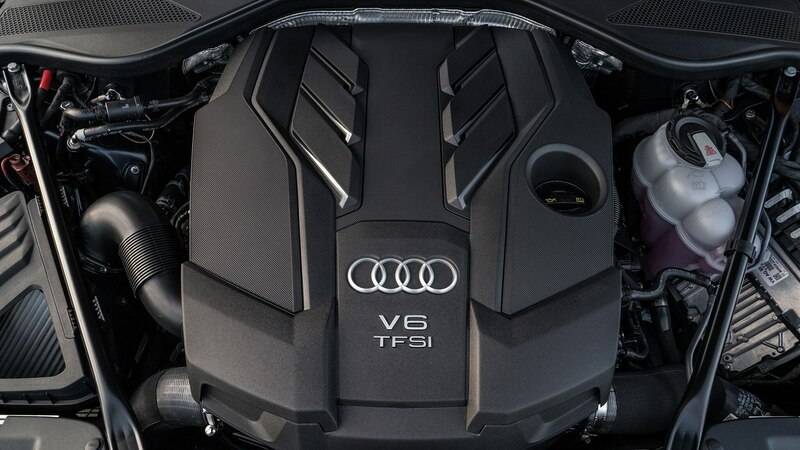 Though laden with a trove of technological bells and whistles, the dynamic fundamentals are sound, if a bit understated, for the first variant to hit the U.S. market: a turbocharged 3.0-liter V-6 producing 335 horsepower and 369 lb-ft of torque, mating to a ZF-sourced 8-speed. 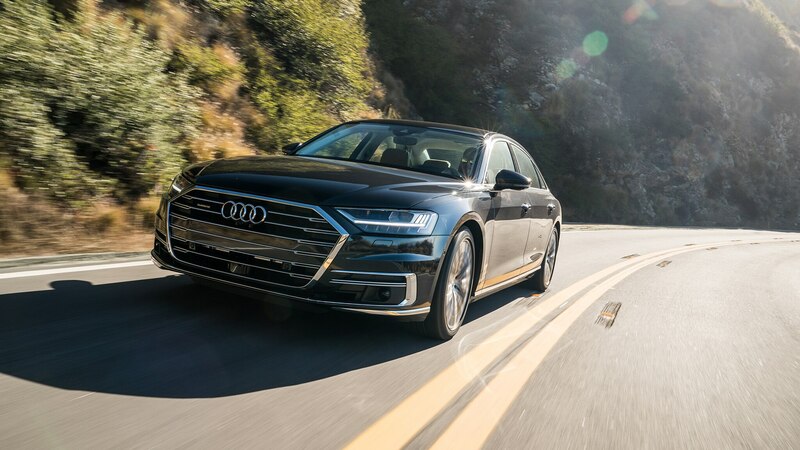 A 48-volt mild hybrid system that uses a 10Ah lithium-ion battery with energy recuperation has been integrated with the ’plant to support accessories and driver assistance systems. 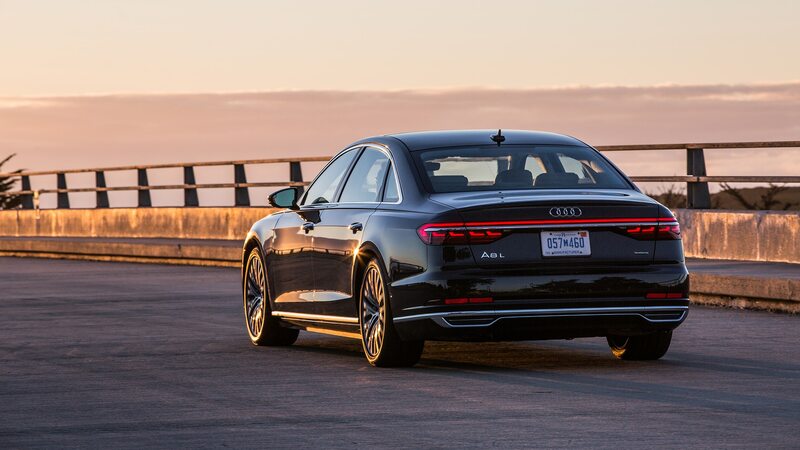 Smoothness and silence predominate the driving experience, of which the A8’s nearly imperceptible styling is an excellent metaphor. 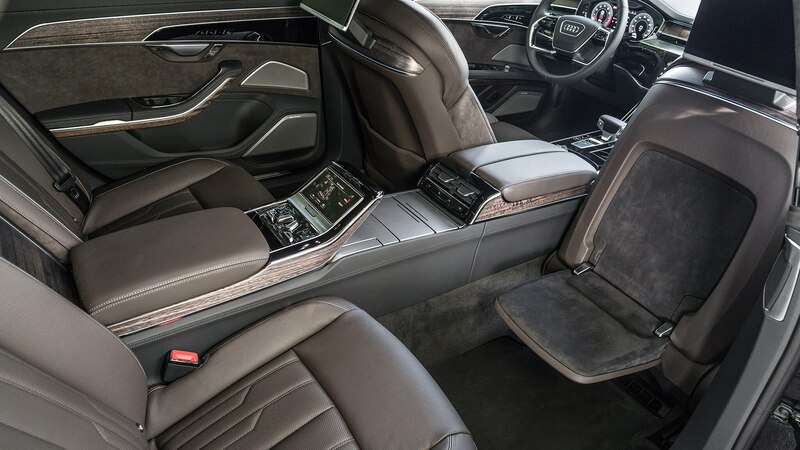 While double-glazed glass aids the remarkably quiet interior, it’s worth noting that the overall focus lies more in creating a luxe but minimalist, spa-like environment than it does an agile, autobahn-storming screamer—at least in this V-6 version. 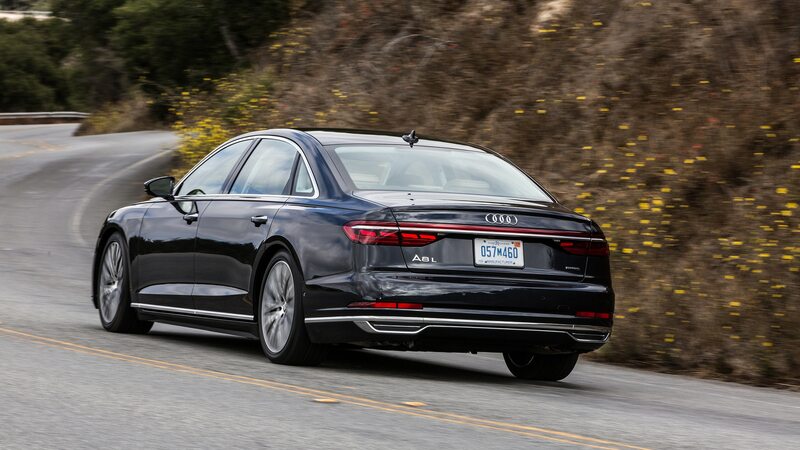 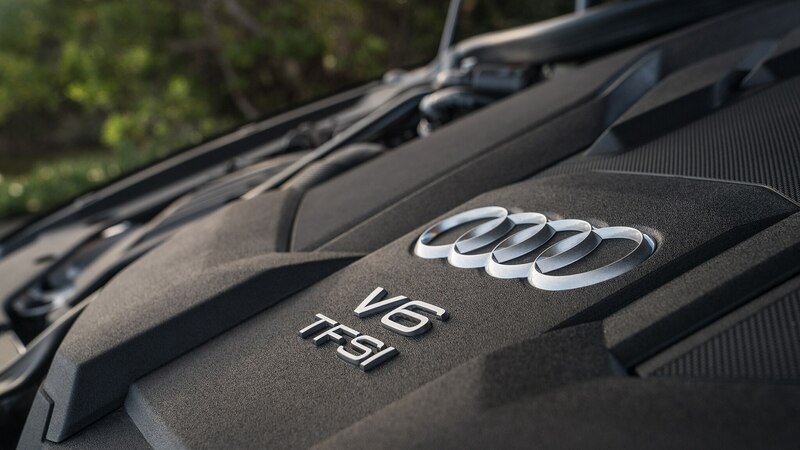 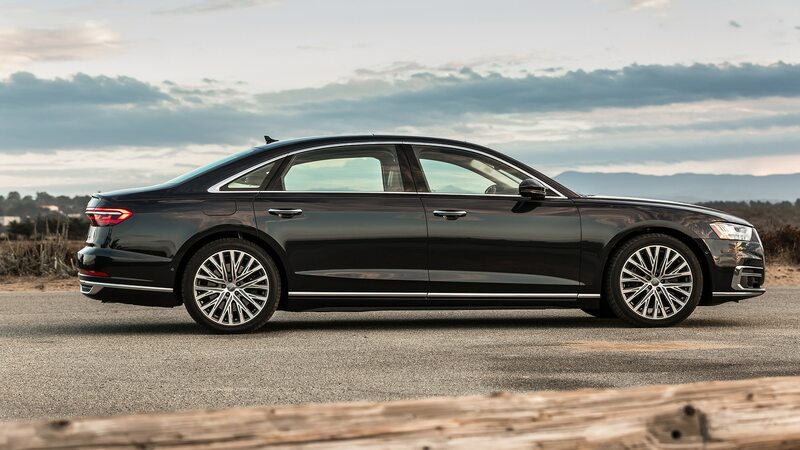 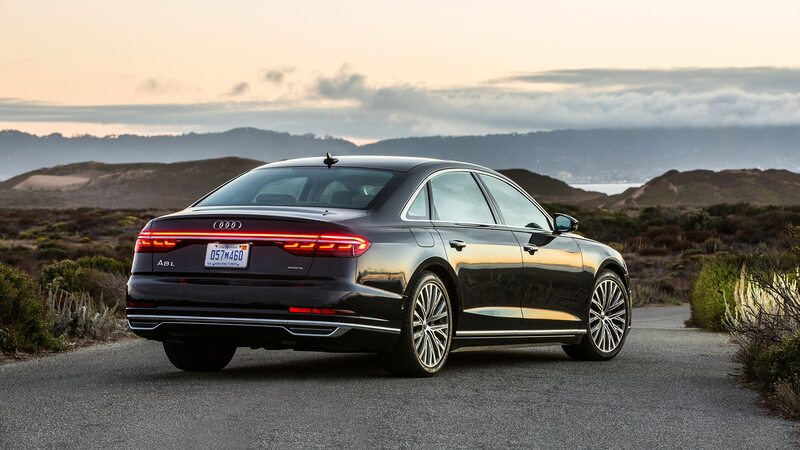 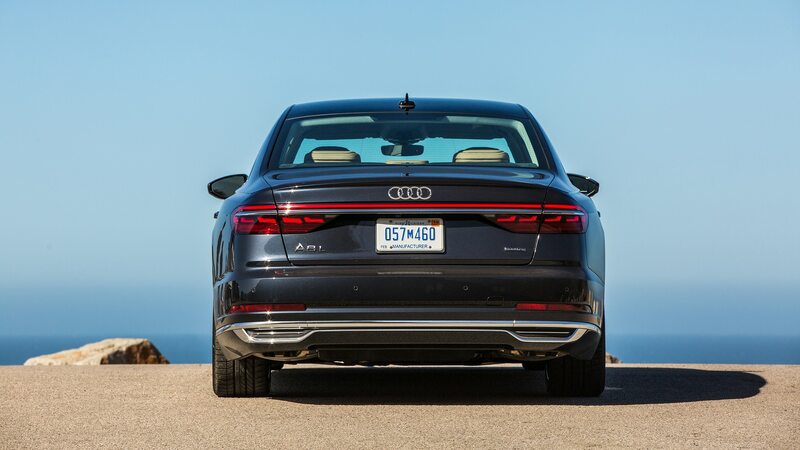 While a subsequent S variant will invariably wield more oomph, the six-cylinder A8 has gained 250 pounds over its predecessor due to all the added equipment, bringing total curb weight to a hefty 4,751 lb. 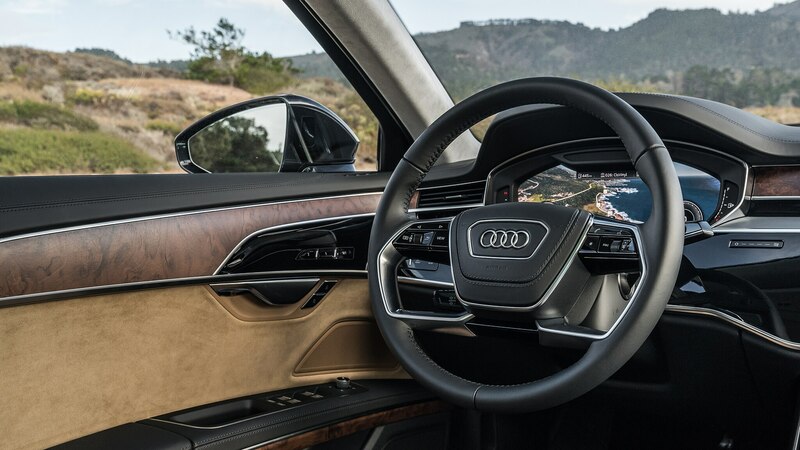 Ameliorating some of that mass is Audi’s optional dynamic four-wheel steering system ($1,950) which Audi says responds more quickly to inputs than its similar setup for the Q7. 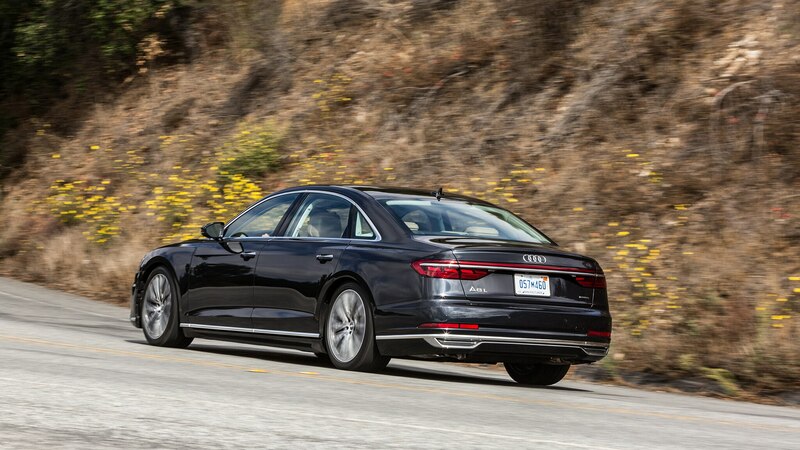 Impressively, the system is the first to adjust the angle of the front wheels in addition to the rears in order to mitigate oversteer or understeer situations. 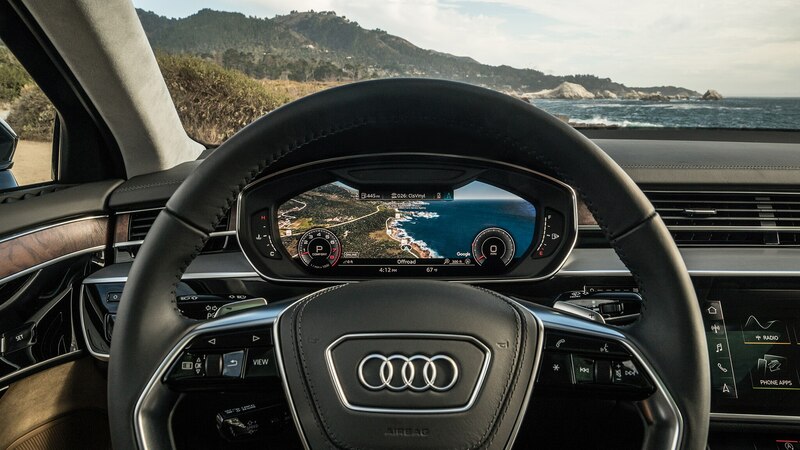 On the tightly winding Nascimiento-Fergusson Road, the A8 managed to juke through the corners quickly, revealing only a reluctance to change directions under more extreme cornering speeds. 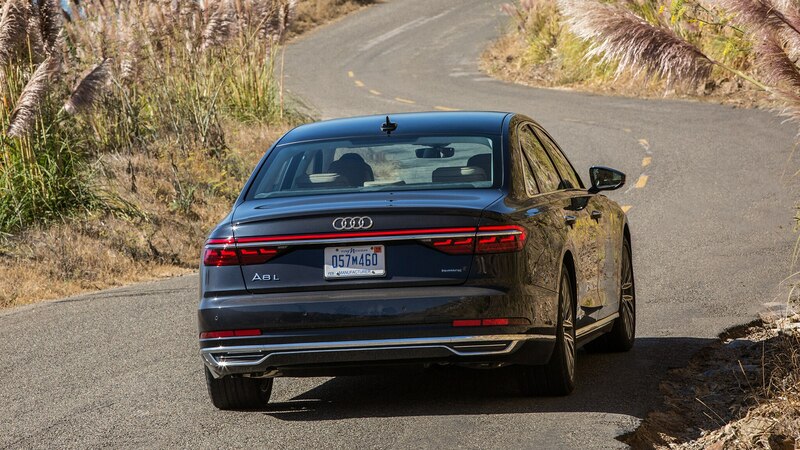 At low speeds the turning circle drops below that of an A4. 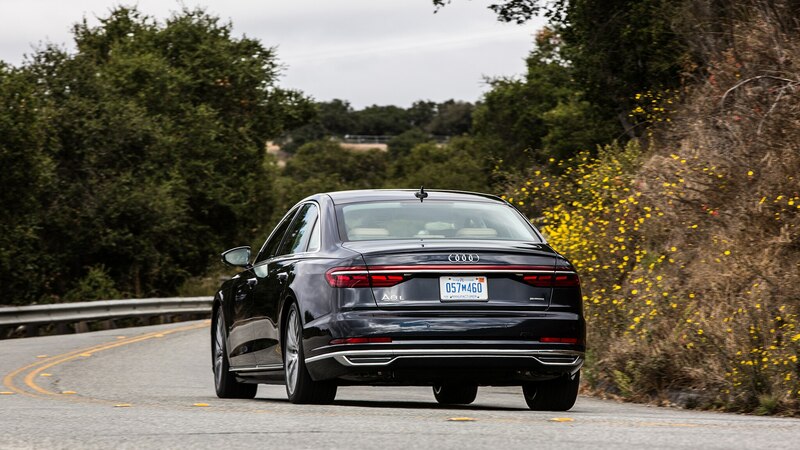 The system works quite well and ought to be standard; if we had our druthers, we’d also opt for summer rubber as the all-season 20-inch tires gave up some grip in favor of versatility. 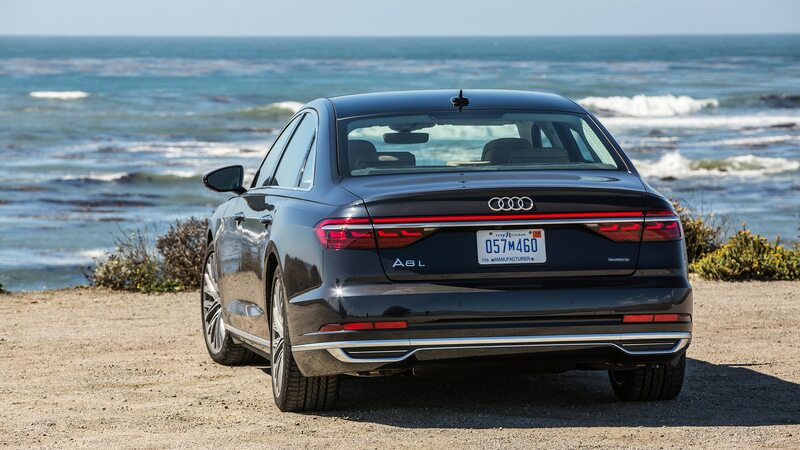 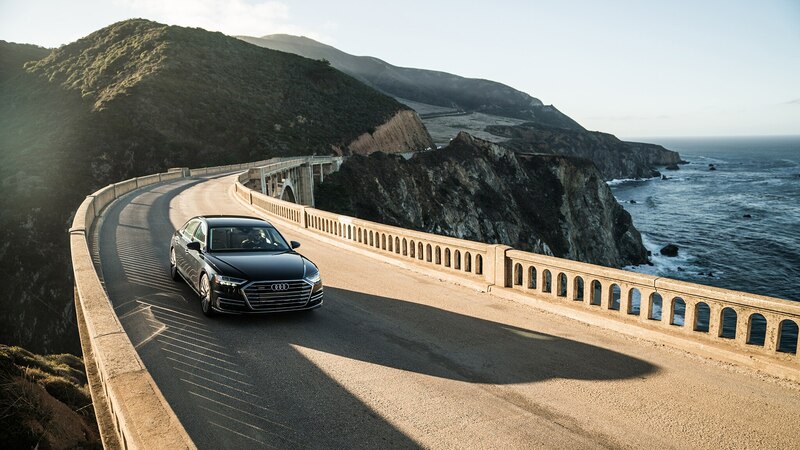 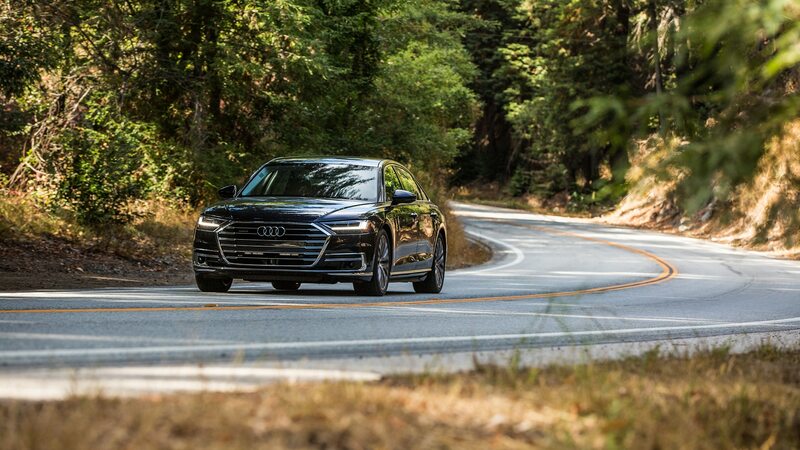 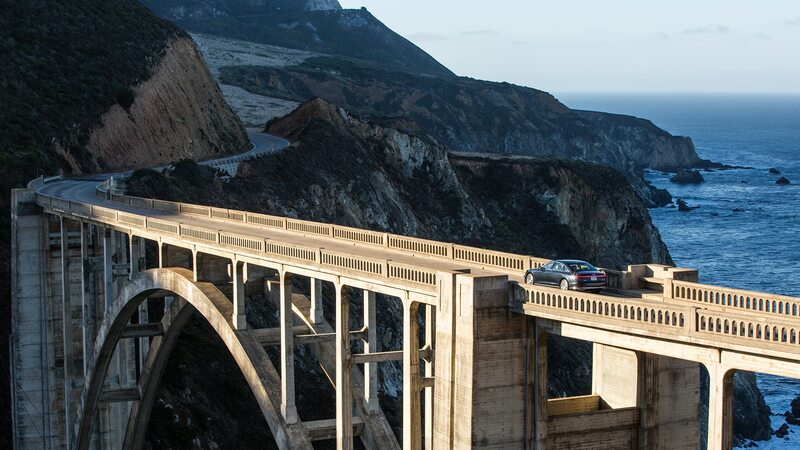 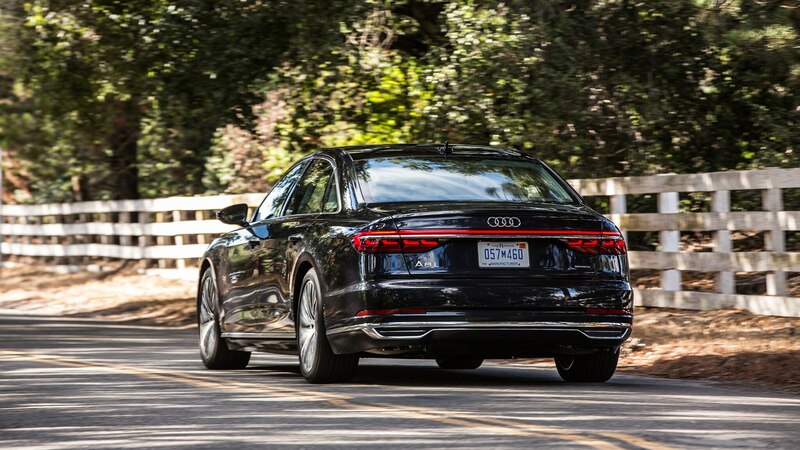 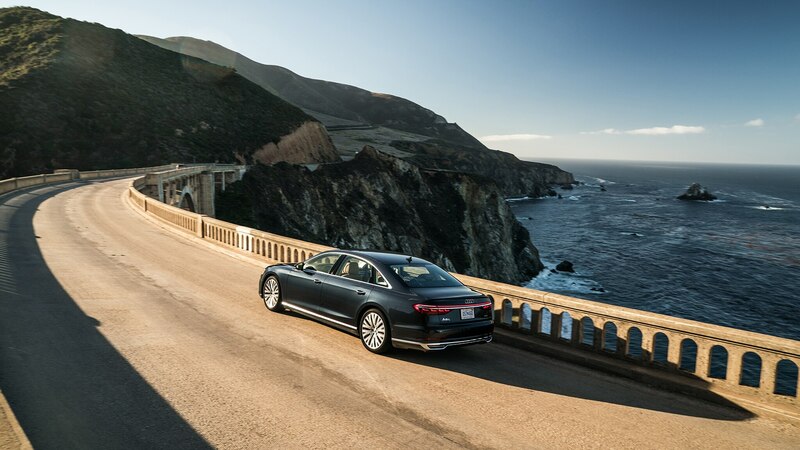 The A8 passed slow-moving traffic along Highway 1 briskly enough during our day-long test drive; with a claimed 0 to 60 mph time of 5.6 seconds, this big boy can certainly get out of its own way. 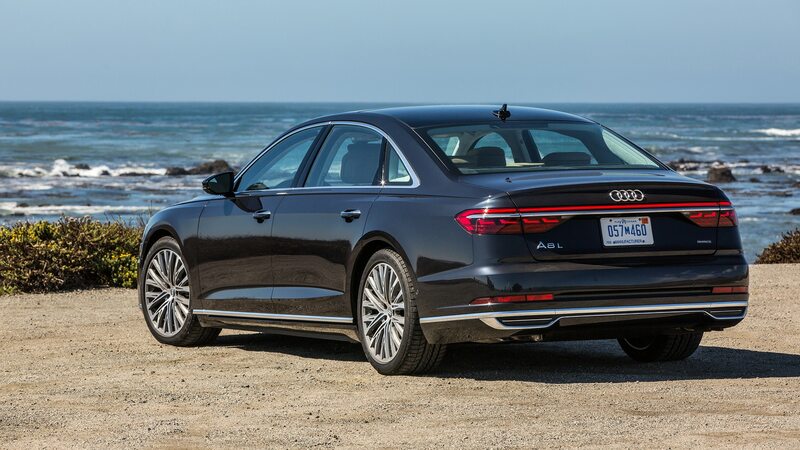 However, it doesn’t exactly feel potent; think, sensory deprivation tank, not guided missile. 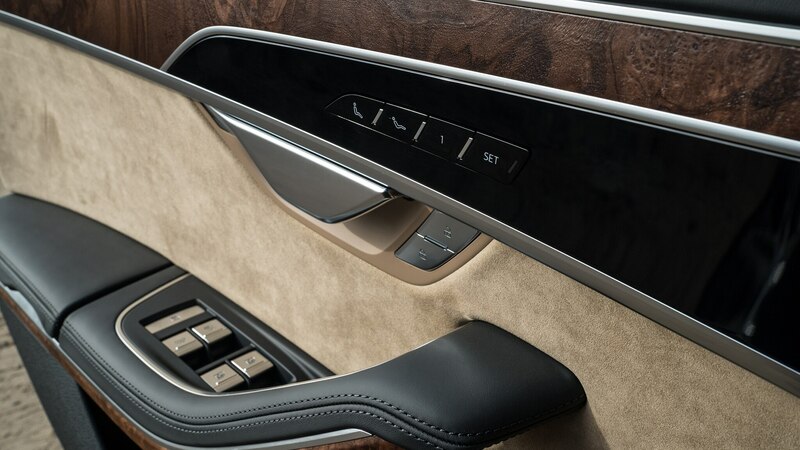 The cabin’s open pore wood, brushed aluminum, leather, and Alcantara surfaces interplay nicely with each other, creating an elegant space that—apart from the nearby digital displays—reflects some of the most tasteful uses of traditional textures and surfaces. 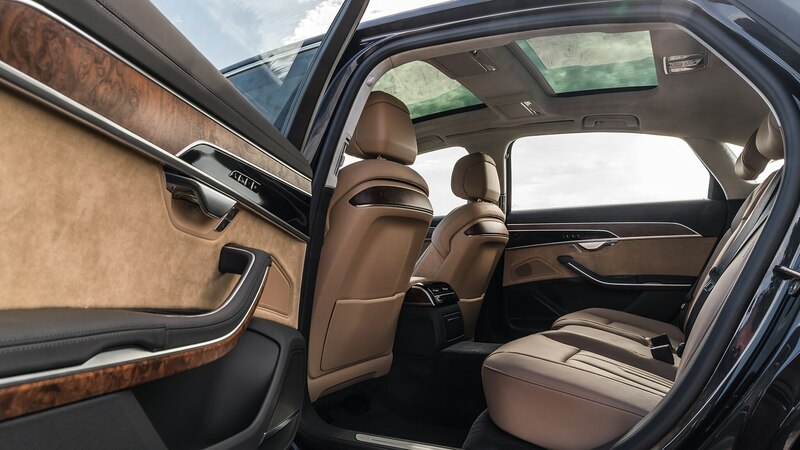 An optional executive rear seat package ($7,550) adds a leather covered center console, folding tables, and a footrest, foot massaged-equipped “relaxation seat” that makes excellent use of the already spacious rear quarters (all U.S. cars will be extended wheelbase “L” models). 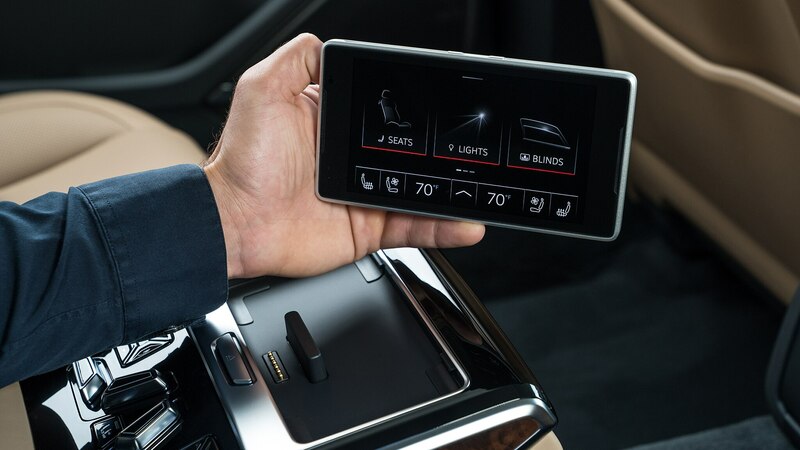 Executive types will also crave the dual Audi tablet system that uses touchscreens for all sorts of LTE WiFi enabled distractions. 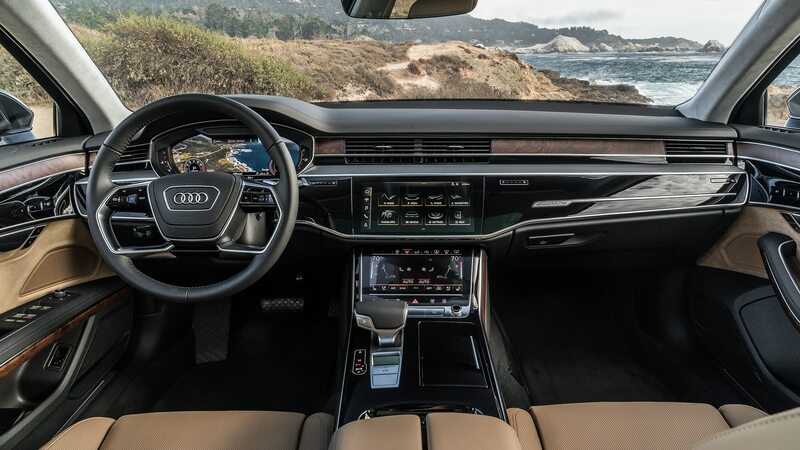 As for the A8’s multitude of multimedia screens, it’s safe to say the same folks who appreciate the deep pile of a proper Alcantara headliner might struggle to love the almost entirely digital interface. 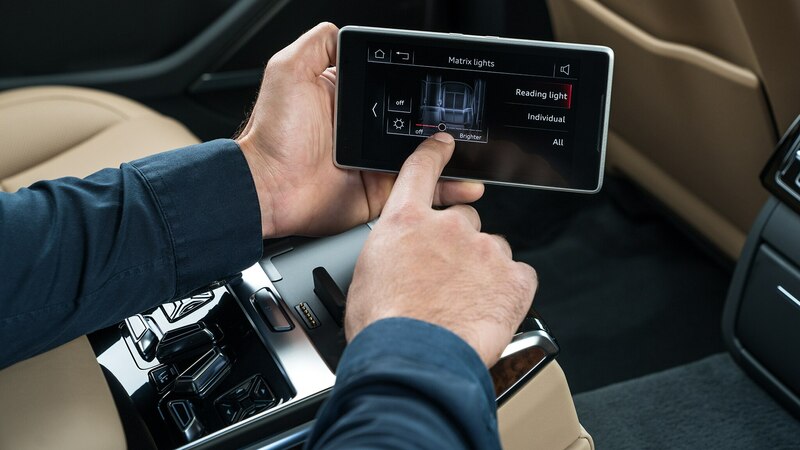 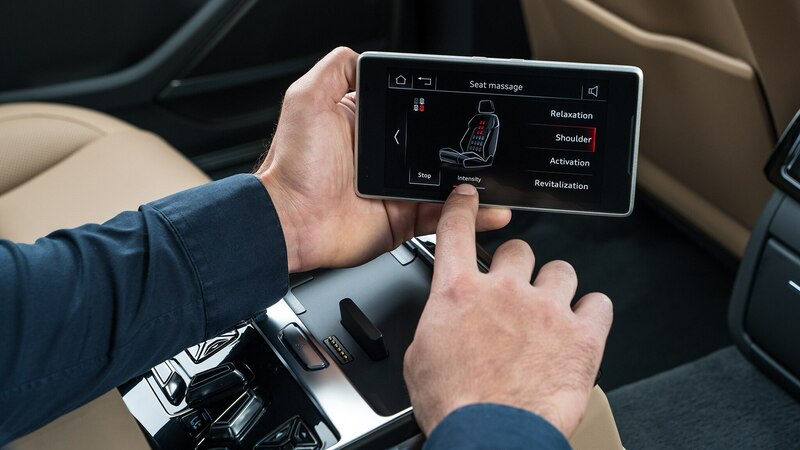 As setups go, Audi’s new MMI touch response system works quite well, with intuitive menu architecture and two screens that can be setup with haptic feedback and three levels of pressure sensitivity (or a purely touch-sensitive arrangement, a la a smartphone). 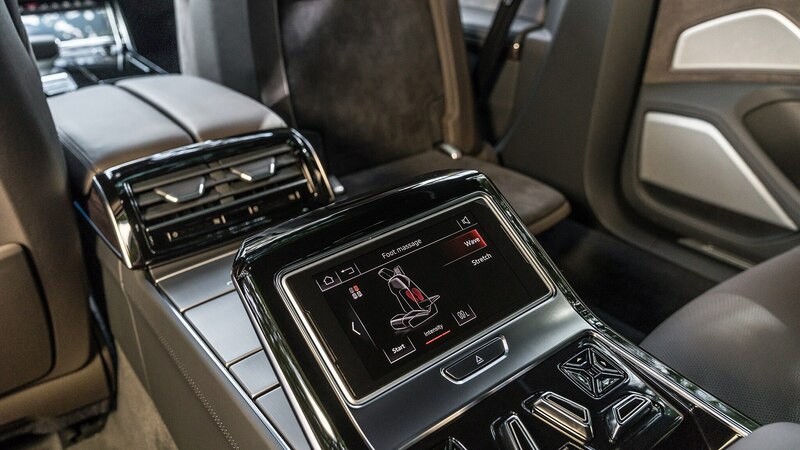 But the issue is not so much the execution as it the loss of buttons and switches that maintain a feeling of connectedness to the car as an operational mechanical vehicle. 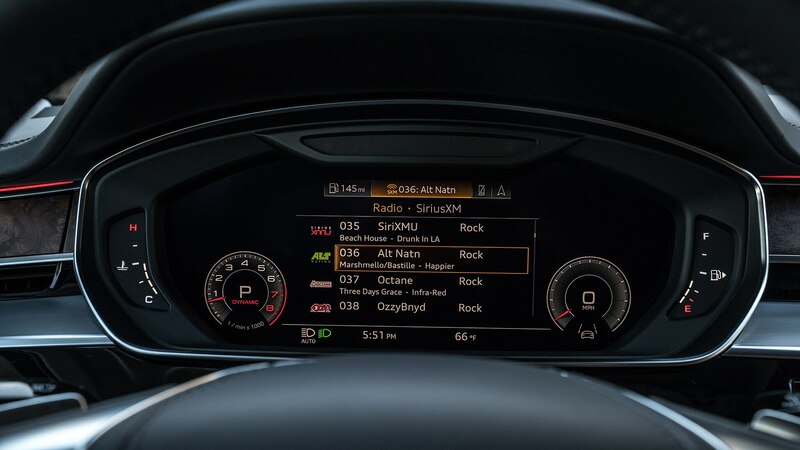 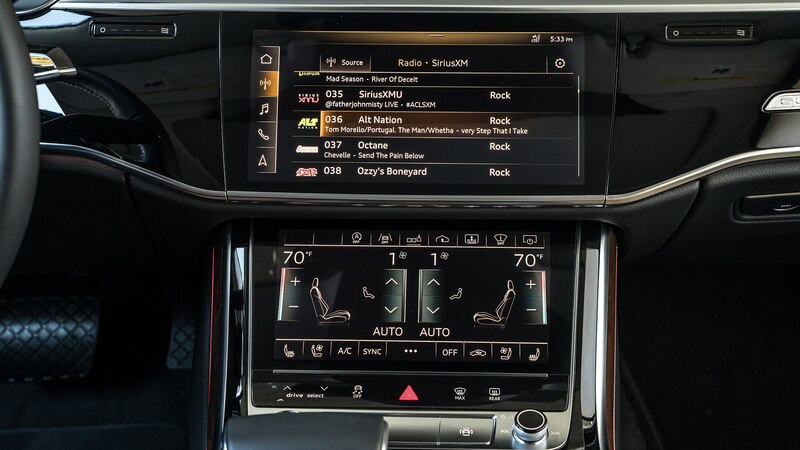 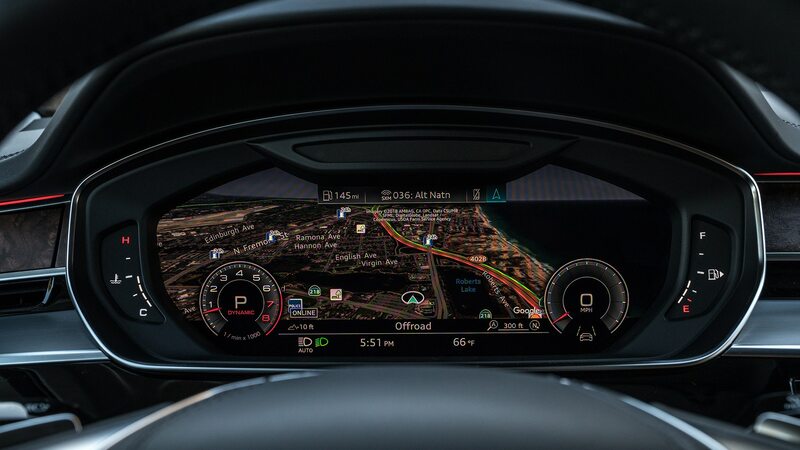 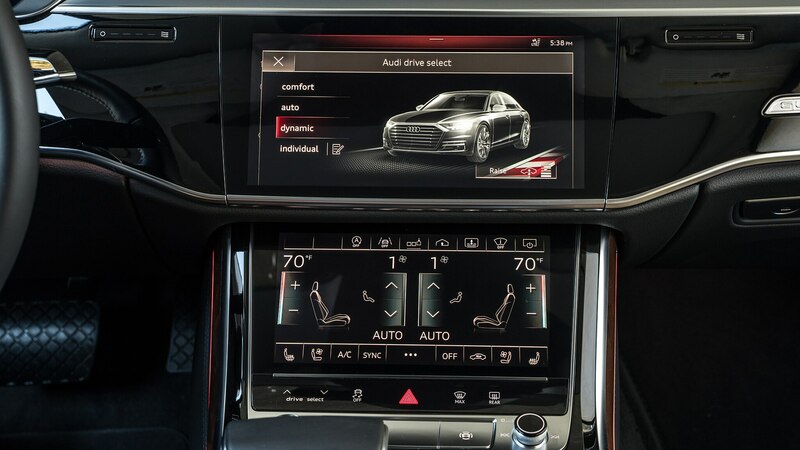 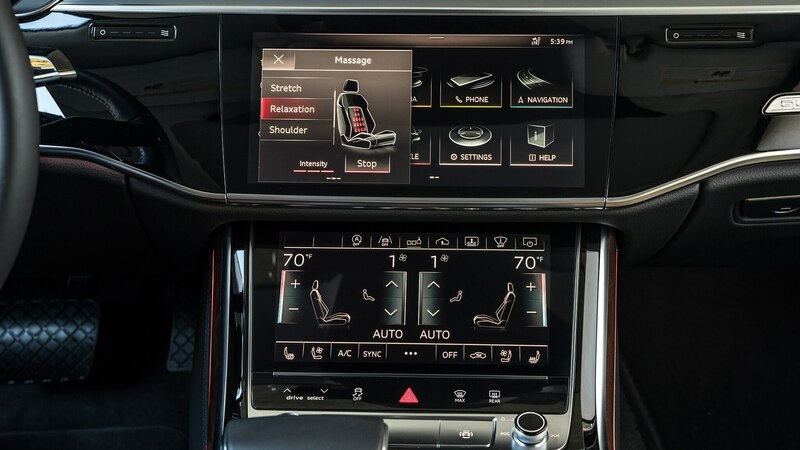 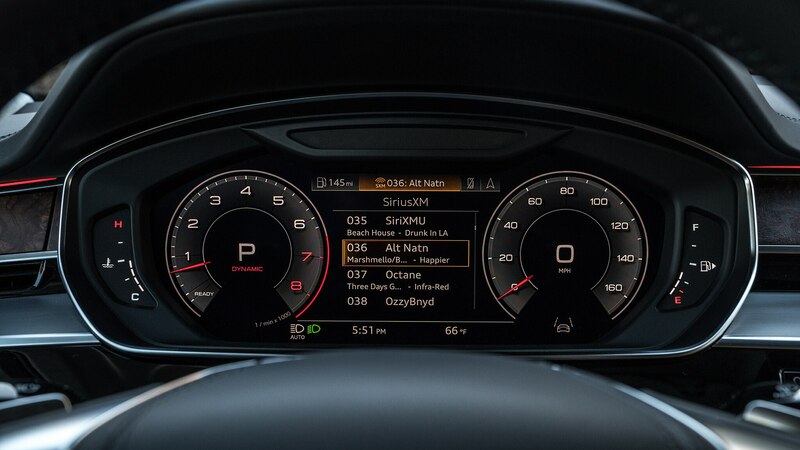 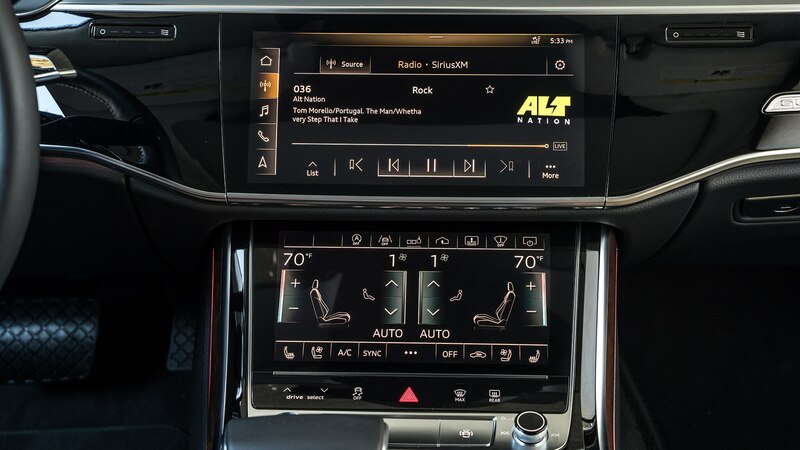 The spread of purely digital interfaces is nothing new, and will only become more ubiquitous across luxury vehicles. 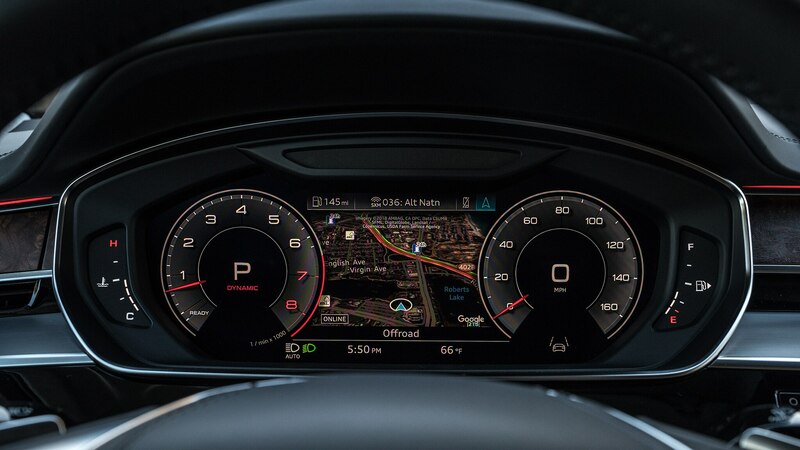 And as they go, Audi’s works well, even offering the small aforementioned touch-sensitive strip that opens and shuts the HVAC vents, a pleasant override for the otherwise minimally finished dashboard panel. 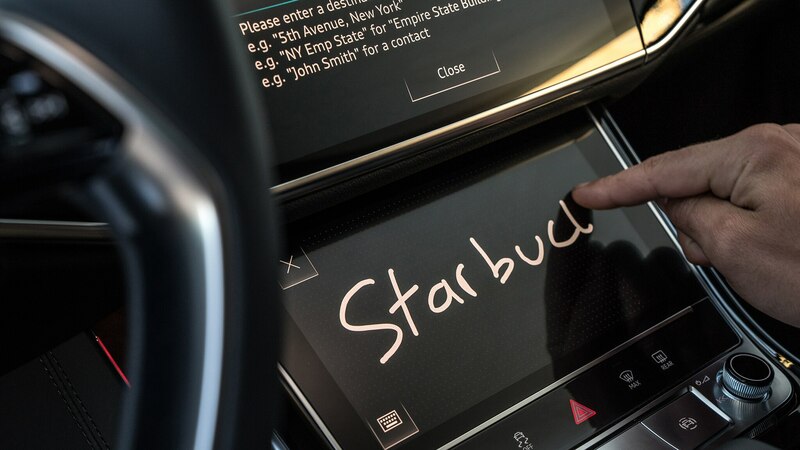 But the usage of a touchscreen also necessitates a bit of fingertip precision, especially in a moving vehicle, that is sometimes less than luxurious. 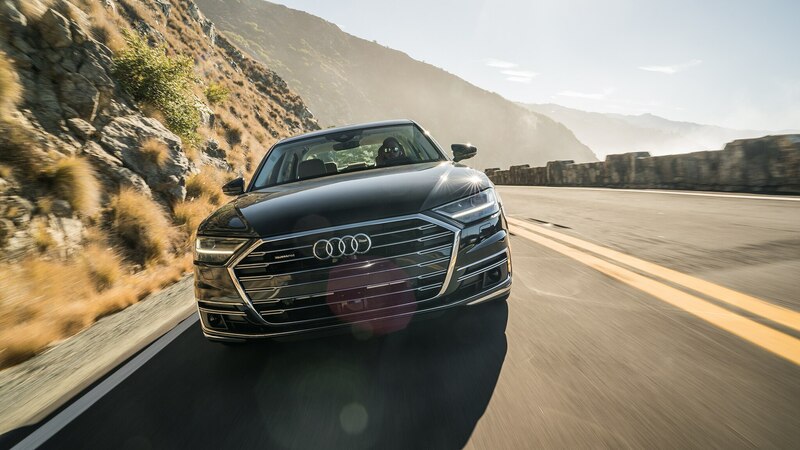 As appears to be an ongoing theme with Audi’s new A8, some of the most noteworthy features are yet to come, among them an advanced electromechanical suspension system that scans upcoming road surfaces and can push or lift individual wheels in order to create a smoother ride. 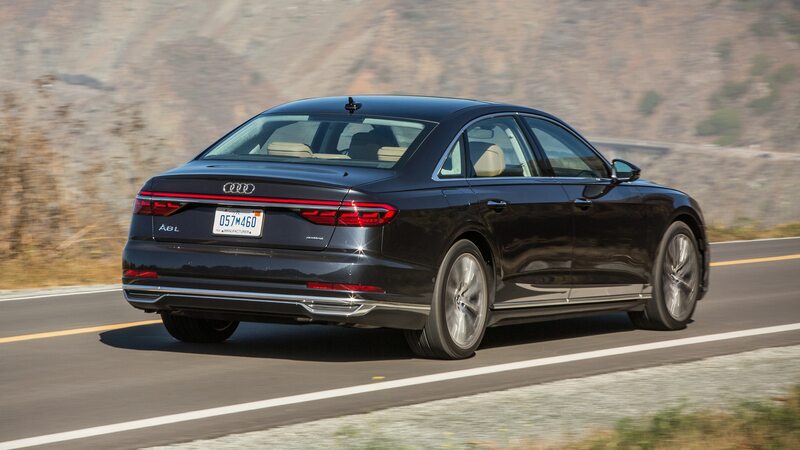 (It’s set to debut sometime next year for the U.S. 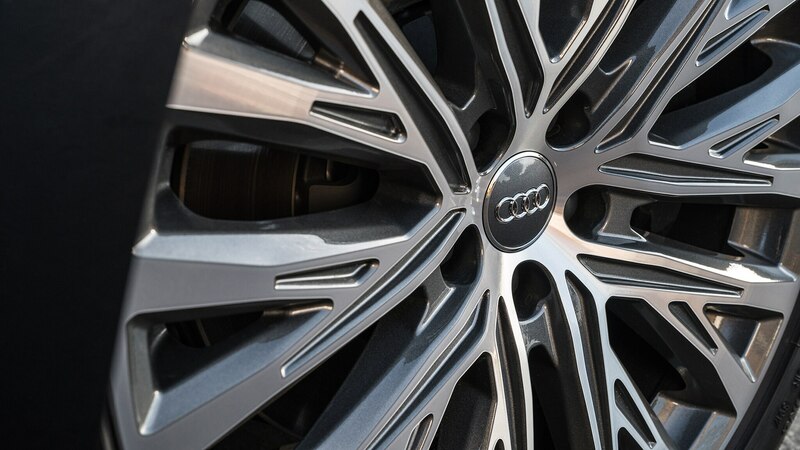 market.) 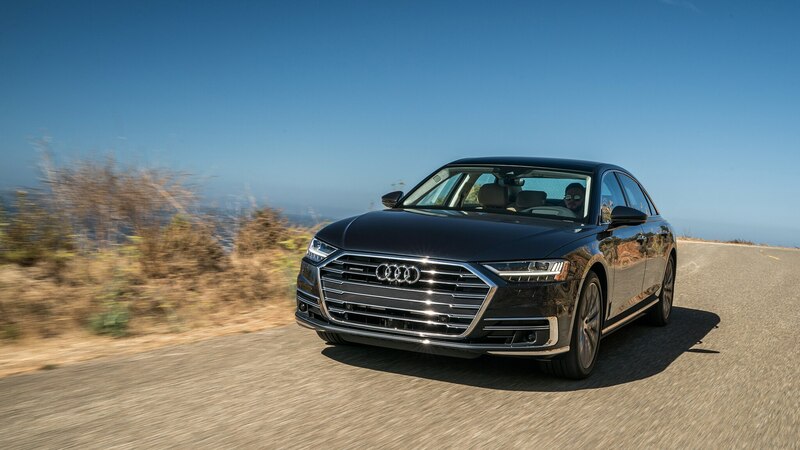 Unlike Mercedes-Benz’s Magic Body Control system, Audi’s uses electrical, rather than slower hydraulic controls to move the wheel in two directions, as opposed to one with the Benz setup. 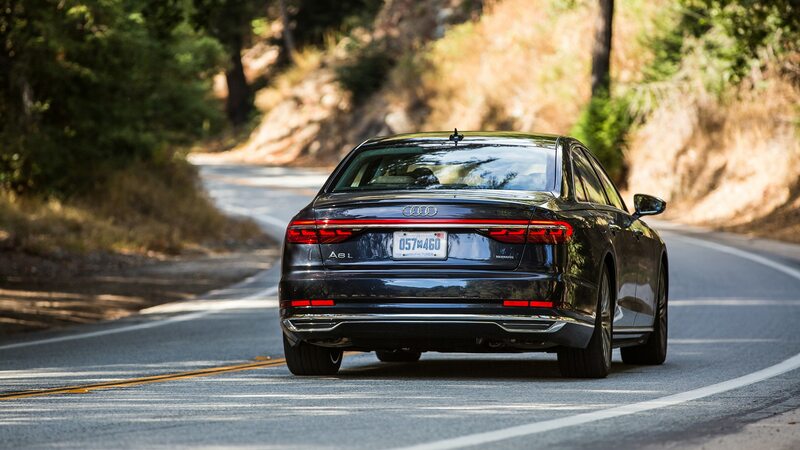 A demonstration on a closed course revealed remarkable isolation over a speed bump at 30 mph, as well the ability to lift one side of the vehicle in order to anticipate an impeding side impact. 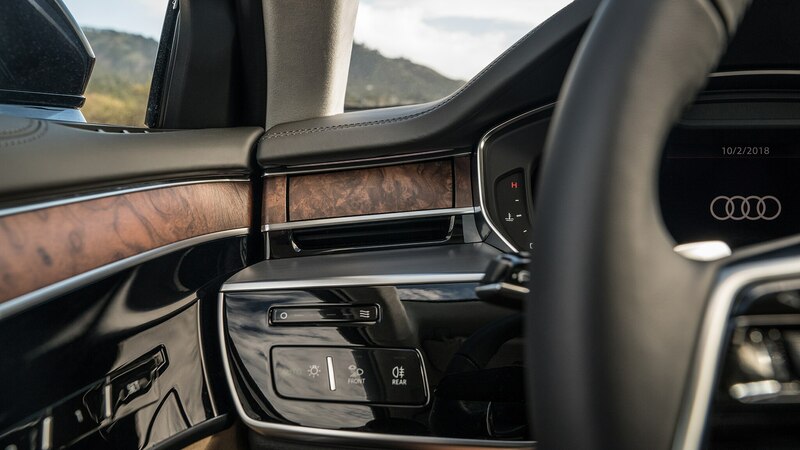 It takes approximately a half second to lift the body and could make a measurable difference in the amount of injuries incurred during these types of accidents. 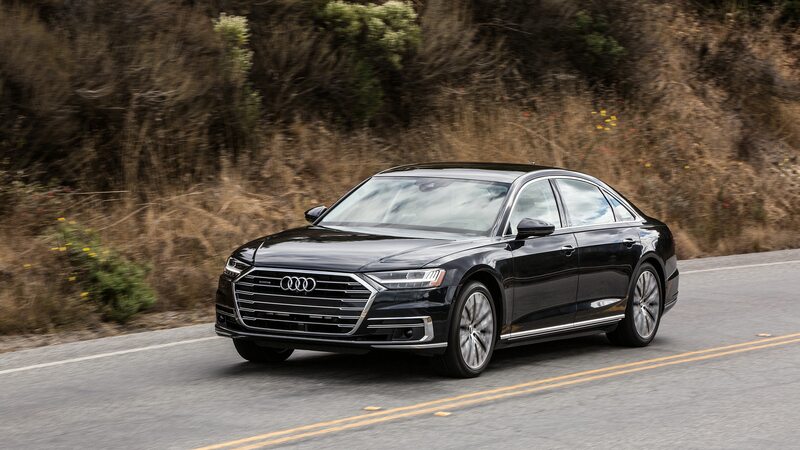 Nascent technology being what it is, one can’t help but feel that the 2019 Audi A8 is begging to be uncorked to its full Blade Runner potential. 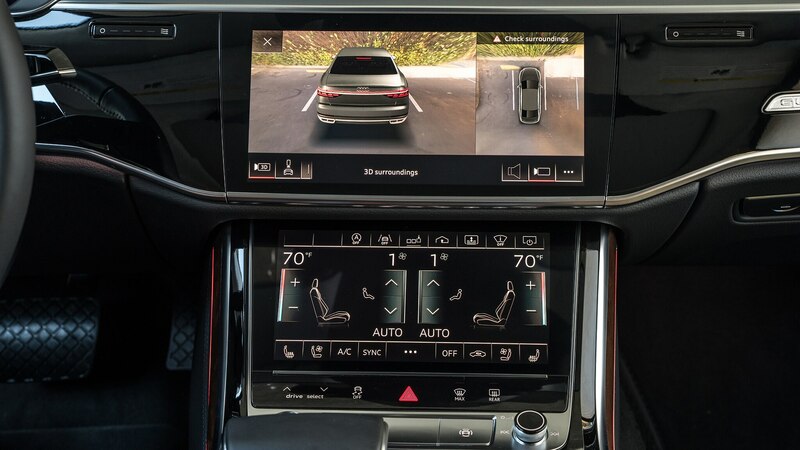 Since regulators can’t decide about Level 3 standards, we have to live with standard adaptive cruise control and a lane-keeping assist system that still allows the car to pinball against the lane’s edge. 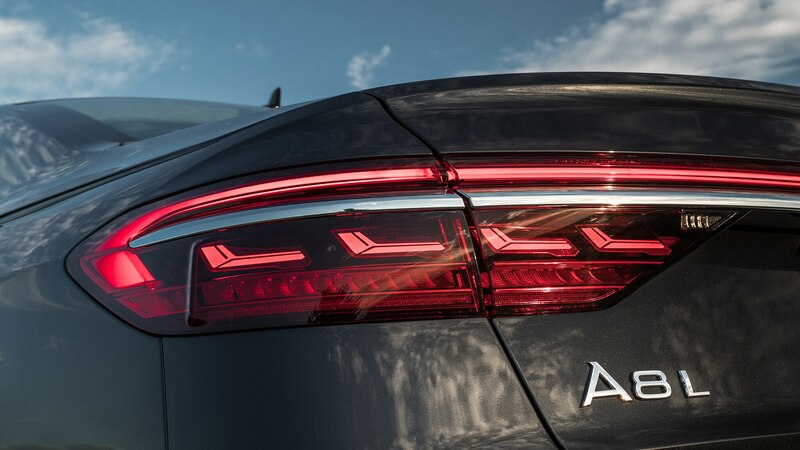 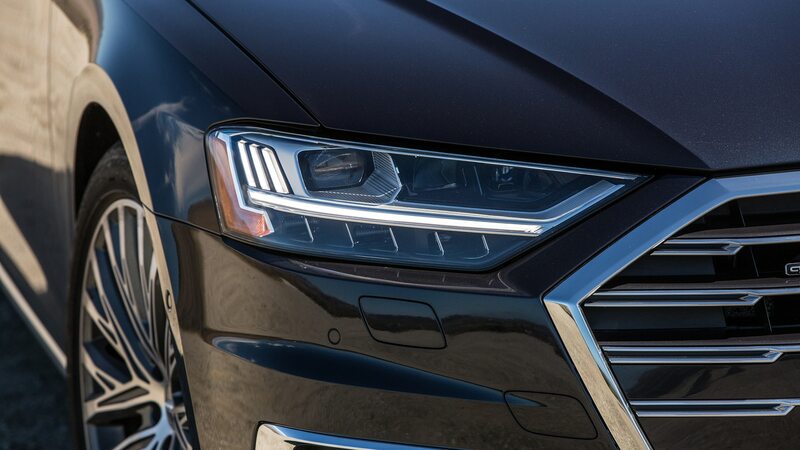 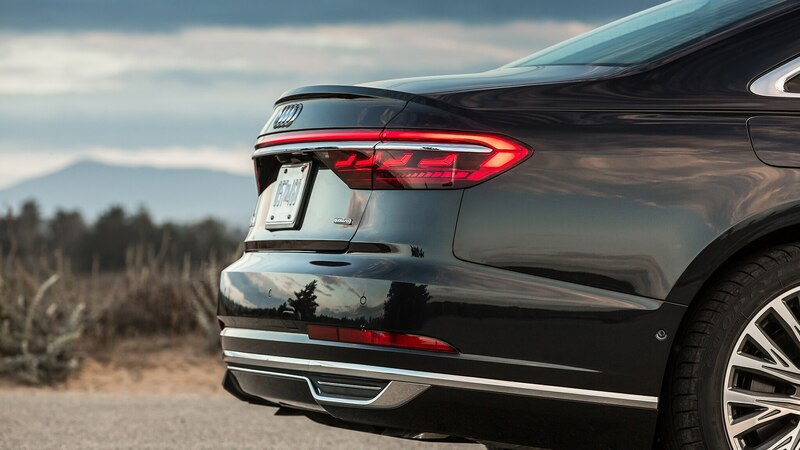 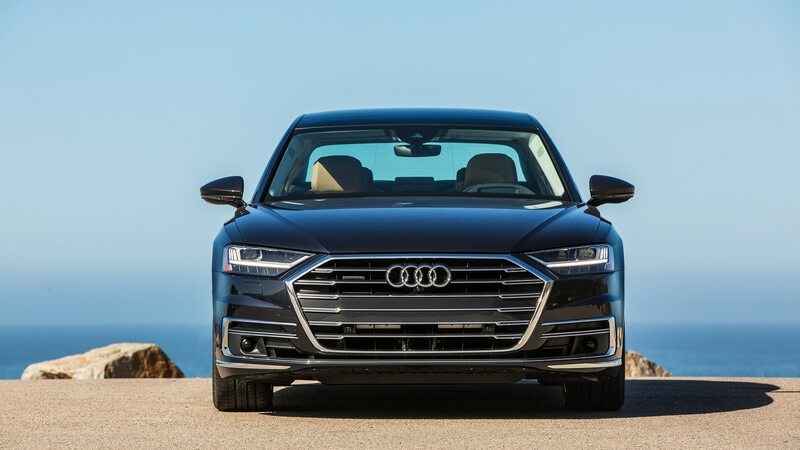 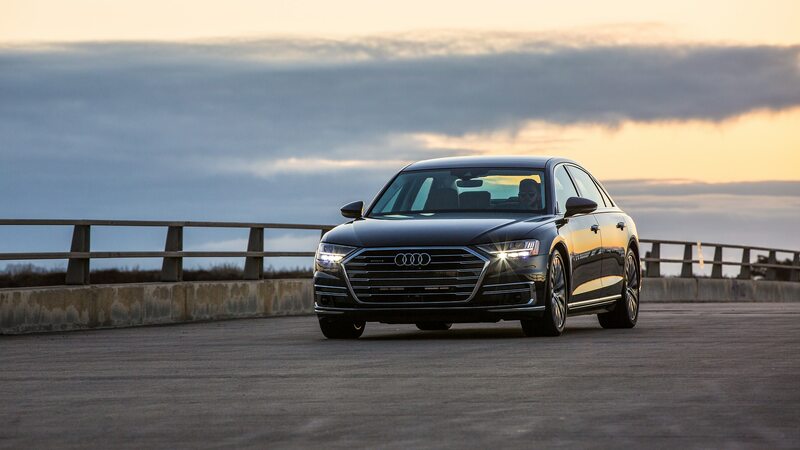 Even the A8’s active matrix headlamps have the hardware to enable advanced safety-minded lighting but are not fully activated because the technology has yet to be greenlit by the U.S. government. 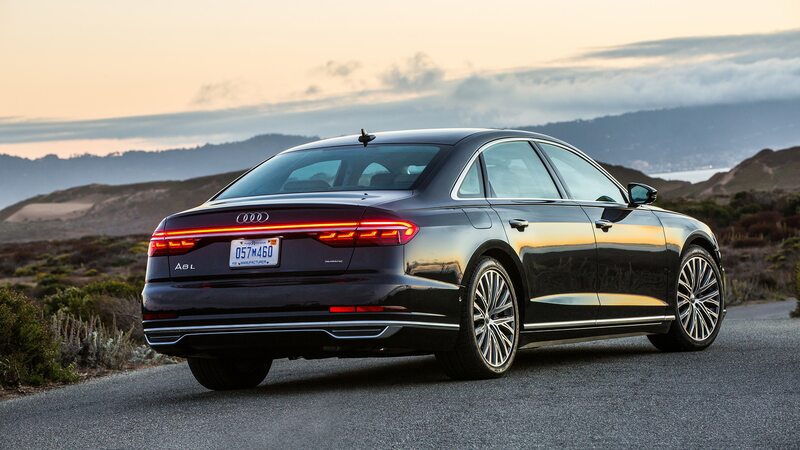 Funnily enough, it was almost exactly a year ago that we drove the first production A8s of this generation, and we were rife with questions about which features might be usable by product launch. 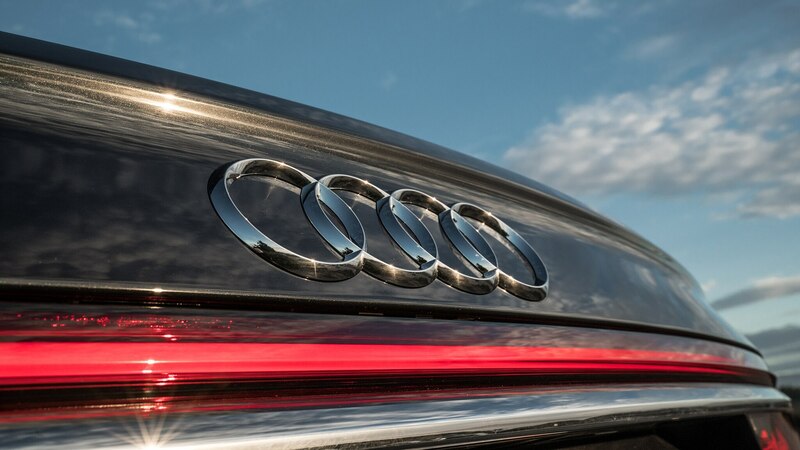 The future may be bright, but it still takes some patience to see it completely through.